To encourage a child to participate in regular structured exercise is to give them a gift for life. Research has proven that children who participate in sporting activities as children are far more likely to continue with exercise throughout their adult life. Taekwon-Do is considered by many experts to be a “life leveller”. Regular training encourages a physical and mental natural balance. It evens out attitudes, emotions, and actions. If a child is short-tempered, Taekwon-Do training with emphasis on the tenets of Taekwon-Do can encourage increased tolerance. If a child is aggressive, structured training will promote increased calmness. 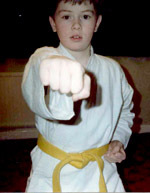 If a child is meek, Taekwon-Do training will increase his/her assertiveness. If a child is anti-social, the Taekwon-Do training programme will encourage them to become more friendly, through social interaction and training based on teamwork and co-operation. If a child is weak, regular training will make him/her significantly stronger. If a child is impulsive, training can encourage him/her to know the time and place for patience. These developments will occur gradually, but parents often find that children become more focused with increased levels of concentration due to the continual setting and achieving of goals, which is a key part of Taekwon-Do training. 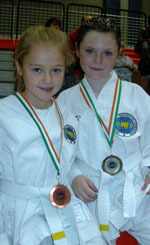 Taekwon-Do has no age limits and is a very good sporting activity for children. Taekwon-Do for children is specifically tailored to support a child’s physical and social development. The focus is on helping children build themselves physically, and on instilling character, self-esteem, effort, concentration, sincerity, respect, self-control, and etiquette. It is a fun, safe system of self-improvement and personal development that is highly recommended by parents, physicians, and educators. Taekwon-Do training for children focuses on developing core skills, including; speed, agility, quickness of movement and thought, stamina and coordination.